Rafa Benitez has said the dressing room is good even after picking up only 6 points form the first 11 games but we are all hoping things will improve quickly before Christmas. 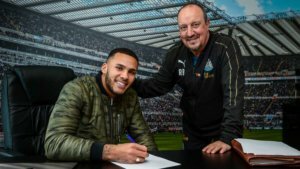 Jamaal Lascelles signed a new improved deal last week, and Mo Diame is the only senior player whose contract runs out next June. The agreement with Rafa is that Mo has to play a certain number of games this season, and he will get a new deal – but Mo is starting to play well this season. The Chronicle are also reporting that Sean Longstaff is close to agreeing a new deal after he has looked impressive in preseason. “Diame has experience and he knows he is playing well. W are hoping Mike Ashley will help Rafa bring three or four good players in during the January transfer window and by then we are also hoping Florian Lejeune will be fit to play. He will be like a new player and when he came in earlier this year it coincided with a strong run by the team. Next Post Can Newcastle Make It Two Wins In A Row - Will Rafa Change The Side? “Diame has experience and he knows he is playing well.” – hmm, not sure about that one. He’s certainly not playing as well as he can, going by the form he showed in the 2nd half of last season when he suddenly became one of the best midfielders in the division. Ask Ed for mine too mate. Here’s a question for debate – who will be the next NUFC player to represent England?